There were lots of nice bikes on hand. This XR1200R turned street-tracker wasn’t even in the show; it was parked outside! Every year the show brings in bikes of age from all over Kansas and western Missouri, but this year, the featured makes were British. From Vincents to BSAs, Nortons to Velocettes, there were plenty of featured bikes on hand. Of course, there was quite a presence from Japanese and American marques with some rare birds on hand, including an in-line four Indian! The AMCA Santa Fe chapter organizers also paid tribute to Ralph Wayne who, for the last decade, put on the Backyard Nationals, a festival of motorcycles… In his backyard! Last year was the the final Ralph Wayne’s so they had an entire wall thrown up of memorabilia to celebrate. The last time you saw a BSA this clean was….? 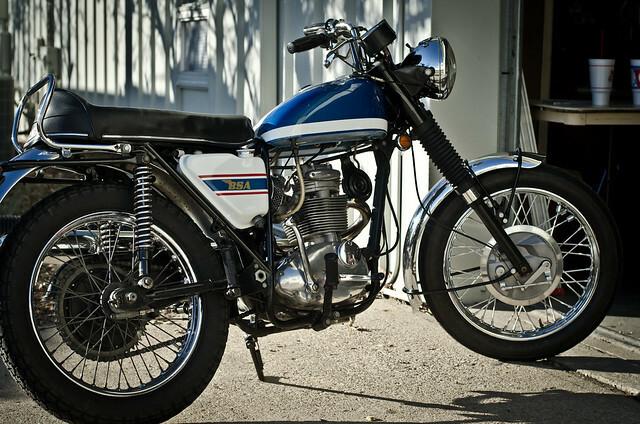 The mission of the AMCA has always been “Preservation, Restoration, and Operation of Old-Time Motorcycles.” The club’s roots were planted in New England back in the 1950s by fans of antique motorcycles. It has grown from a handful of enthusiasts to over 11,000 members, becoming one of the largest antique motorcycle clubs on the planet. If you have a machine(or two, or three, or thirty) that is at least 35 years old, enjoy classic motorcycling and are interested in meeting like-minded individuals, definitely give the AMCA a look. There are over 50 chapters in North America and the main site has forums with plenty of information about all sorts of makes and models. This entry was posted in Events, Local, Pictures, Videos and tagged AMCA, Antique, Backyard Nationals, British, motorcycle, Ralph Wayne by MCCKeef. Bookmark the permalink. Guest blogger who is in to wheels, motors and games or videos about wheels and motors.